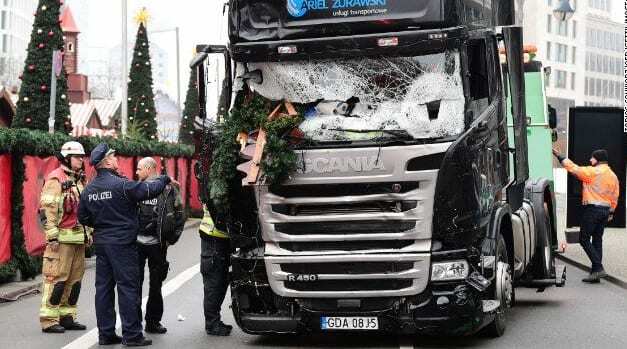 German investigators are searching for a Tunisian man whose identity document was found in the cab of the 18-wheeler that crashed into a Christmas market in Berlin on Monday, German media reported Wednesday. According to Der Spiegel, the temporary residency permit points to a man in his early 20s who goes by the name Anis A., born in the southern Tunisian city of Tataouine. On Tuesday, the Islamic State claimed responsibility for the attack, which killed 12 people and injured 48, though it did not identify the purported ISIS-inspired assailant. Germany initially arrested a Pakistani asylum-seeker, but released him on Tuesday citing a lack of evidence tying him to the attack. Berlin police say they had gotten 508 tips on the attack by Tuesday night, and are examining DNA evidence gathered from the cab of the semi. This entry was posted on December 21st 2016 at 10:35am/10:35 and is filed under Live News Column 1, Politics, Terrorism, World News. You can follow any responses to this entry through the RSS 2.0 feed.